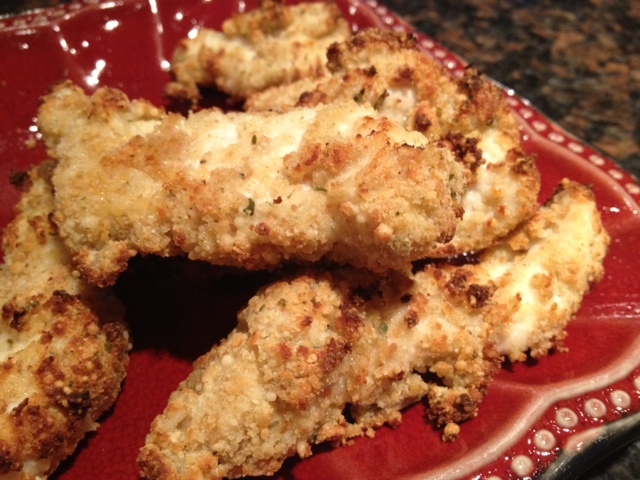 Parmesan Chicken Tenders with Zesty Mediterranean Sauce: YUM!!! I am not a fan of fried food or fast food. But the kids were hungry yesterday at lunch time and when I asked what they wanted to eat, they all cheered to say” Chick-Fil-A. I did not feel like running anywhere to get them some food so I improvised to make some chicken tenders. And yum, they were!!! I even ate some myself. Ingredients for 4 people for the chicken tenders: 2-3 chicken breasts, 3/4 cup of italian bread crumbs, 3/4 cups of grated parmesan, 1/4 tsp of salt, 1/8 tsp of pepper, 1 egg. 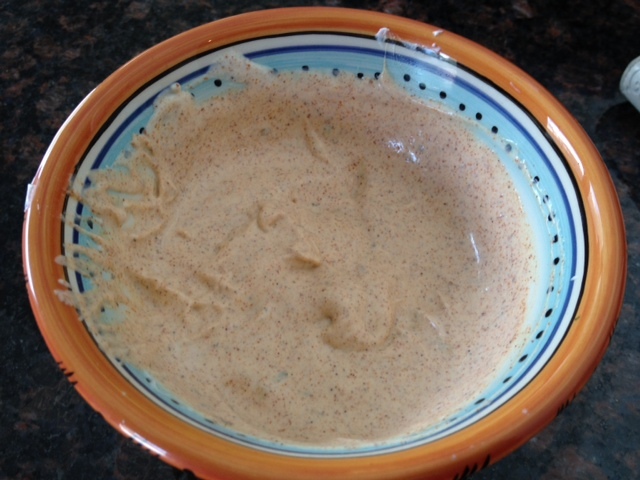 Ingredients for the zesty Mediterranean Sauce( yield 2/3 cup): 1/3 cup of sour cream ( regular, lite or fat-free), 1/3 cup of mayonnaise ( regular or light), 2 tsp of Demarle Zesty mediterranean herb mix or more if you want it more spicy. Turn the oven on the 450. Clean the chicken breast of any fat. Then place one chicken breast inside the roulpat and fold the roulpat over the chicken breast. With the rolling pin, pound the chicken breast to flatten it a bit. Remove the chicken breast and repeat this process with the other ones. Place the chicken breast on the chopping block and slice the chicken in its width in small strips of 1/3 of an inch. Place those strips in the metal bowl and add the salt and pepper. Mix well to coat the chicken. Add the egg and mix well again to make sure that all chicken strips are well coated with the egg mixture. In another bowl, mix the parmesan and the italian bread crumbs and mix well. With your fingers, transfer the chicken strips in the bread mixture and mix so that the chicken fingers will be coated with the bread mixture. Take a large silpat or 2 medium silpat ( previously laid on perforated sheet) and lay the chicken breasts on the it. Place the perforated sheet in the oven and cook for 6-8 minutes. Meanwhile prepare the sauce: in a medium-sized bowl, mix all the ingredients mentioned above and stir. 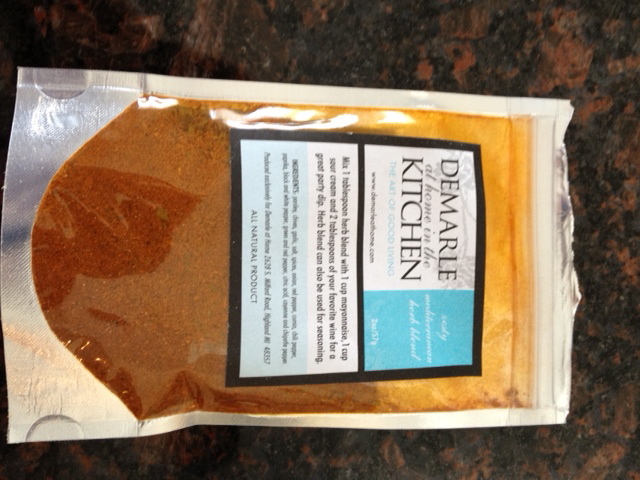 You may add more of the seasoning if you want your sauce to be more spicy. Et voila!! !